On the 2nd (Sun), admire the striking features of Qutub Minar, admire the natural beauty at Humayun's Tomb, and then don't miss a visit to Jahanara Begum's Tomb. Get ready for a full day of sightseeing on the 3rd (Mon): contemplate in the serene atmosphere at Birla Mandir Temple (Lakshmi Narayan), then contemplate the long history of Gurudwara Bangla Sahib, then steep yourself in history at India Gate, and finally explore the historical opulence of Red Fort (Lal Quila). 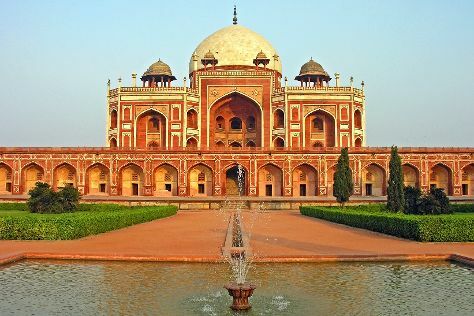 For more things to do, reviews, and tourist information, go to the New Delhi online trip itinerary builder . Amritsar to New Delhi is an approximately 3-hour flight. You can also drive; or take a train. In June, daytime highs in New Delhi are 45°C, while nighttime lows are 32°C. Finish your sightseeing early on the 3rd (Mon) so you can travel to Dubai. Venture out of the city with trips to Abu Dhabi (Emirates Palace & Sheikh Zayed Grand Mosque Center). Fill the 6th (Thu) with excitement at Aquaventure Waterpark. There's much more to do: enjoy breathtaking views from Burj Khalifa, admire the striking features of Emirates Towers, get engrossed in the history at Al Fahidi Fort, and make a splash at Wild Wadi Waterpark. For reviews, ratings, traveler tips, and tourist information, read Dubai road trip planner. Traveling by flight from New Delhi to Dubai takes 6 hours. Alternatively, you can do a combination of flight and shuttle. You'll gain 1 hour traveling from New Delhi to Dubai due to the time zone difference. In June, daytime highs in Dubai are 47°C, while nighttime lows are 35°C. Wrap up your sightseeing on the 7th (Fri) to allow time to travel back home.